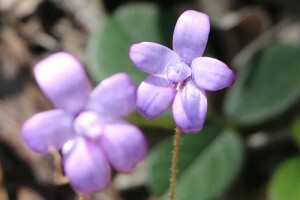 The Purple Enamel Orchid (Elythranthera brunonis) only grows in the southwest of Western Australia. The petals are shiny and look like they have been enamelled, hence the name. Surprisingly, the backs of the petals are spotty. They are difficult to photograph in even the slightest wind as the stem is very slender so it is always moving.